It’s no secret that I’m a big fan of Mad Hatter’s I Love Donuts e-juice, so I was definitely excited to try out the newest addition to their line of dessert-flavored juices: I Love Cookies. How does it stack up compared to I Love Donuts and other popular dessert e-liquids? 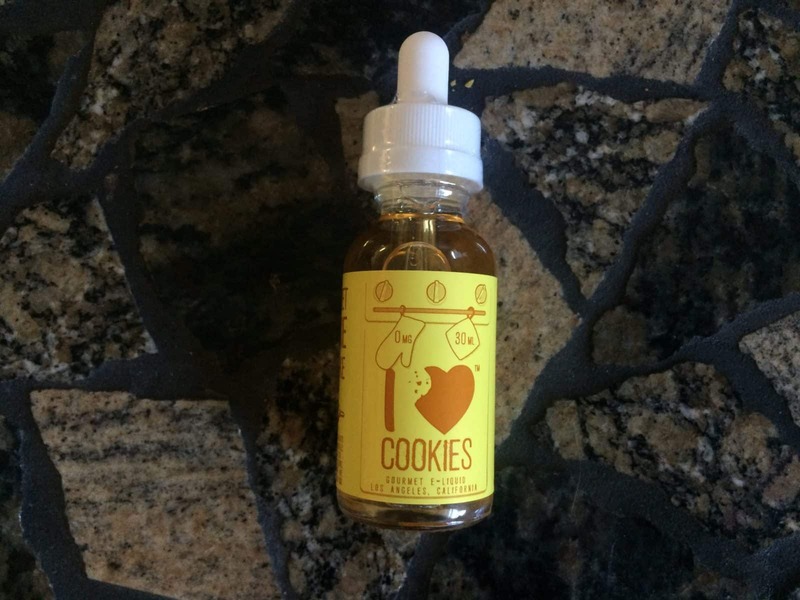 I Love Cookies comes in a standard 30mL glass bottle enclosed in a vertical cardboard box that is designed to be stand out on a crowded shelf in a vape shop. As a sucker for well-executed presentation of products, I’m glad to see that Mad Hatter brought their A-game when it comes to the packaging of I Love Cookies. Right out of the box you’ll be greeted with the aroma reminiscent of sweet, freshly baked oatmeal cookies, building the anticipation of what’s to come. The sleek, minimalistic yellow wrapper does a great job of representing the lighthearted vibe that helped make I Love Donuts such a smashing success, with I <3 Donuts (I’m not sure if that’s how you make a heart symbol on a keyboard) emblazoned on the front, with the heart symbol appearing to have a bite taken out of it. The side of the wrapper shows an image of a flour roller and a cookie with the words “I never met a cookie I didn’t like”. Like I said, I’m a sucker for the presentation of products. On to the actual juice itself. The flavor has a powerful, sweet oatmeal cookie taste on the inhale with subtle notes of caramel and strawberries. On the exhale I noticed that the flavors were a little more balanced, with the strawberry and caramel flavors becoming more prominent while the cookie taste was, while still present, slightly diminished. The 60/40 PG/VG ratio gives I Love Cookies an excellent balance between flavor and cloud-chasing capabilities. I was able to get decent sized clouds while using my Lone Wulf mech mod and RDA setup, as well as while using a KBOX 200 with a Sense Herakles tank. No matter what your preference is when it comes to mods, you’ll get great performance out of I Love Cookies. Overall, I Love Cookies is a great flavor for fans of sweet dessert juices. It’s a well-balanced, complex flavor that works well as an post-dinner vape or even an all day vape if you really have a sweet tooth. I wouldn’t recommend it for fans of fruity flavors, as the strawberry flavoring is more of a dessert-style creamy strawberry, and it isn’t very prominent in the flavor profile. I Love Cookies is available in a 30mL size and comes in 0mg, 3mg, 6mg, and 12mg nicotine strengths. Get I Love Cookies at madhatterjuice.com.